If you were to ask me a couple of years ago, if I see myself being associated with arts nearly every weekend, I would probably laugh my heart out right away. Such was how I am couple of years ago. I would stick myself closely to a rigid and repetitious routine and live the same boring life over and over again. Things changed for me last year when I attended the very first concert of my life and from that day my life has been real colourful. Such is an amazing thing getting yourself involved and experiencing the beauty of what the world of arts has to offer is very satisfying. I am glad I did it last year and now I am going to give you 3 REASONS WHY YOU SHOULD ATTEND THE UNI-ART FEST 2018. Before I get into the reasoning, here is some information for you regarding the festival. This amazing Art Fest is proudly brought to by Unique Arts Culture & heritage Foundation Negeri Sembilan. 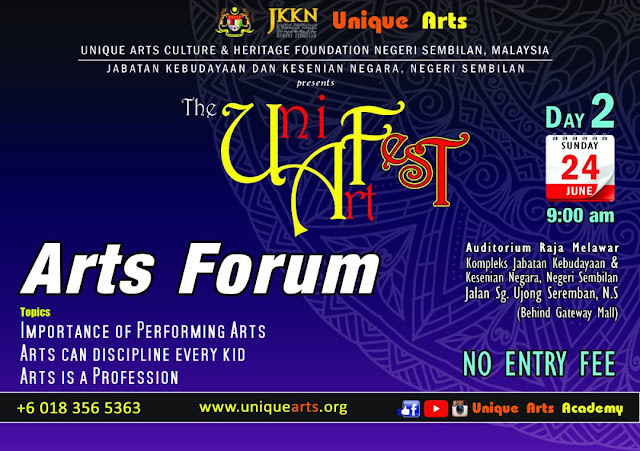 The Uni-Art Fest 2018 will be a 2 day festival happening on the 23rd to 24th of June 2018, which is this coming Saturday & Sunday. 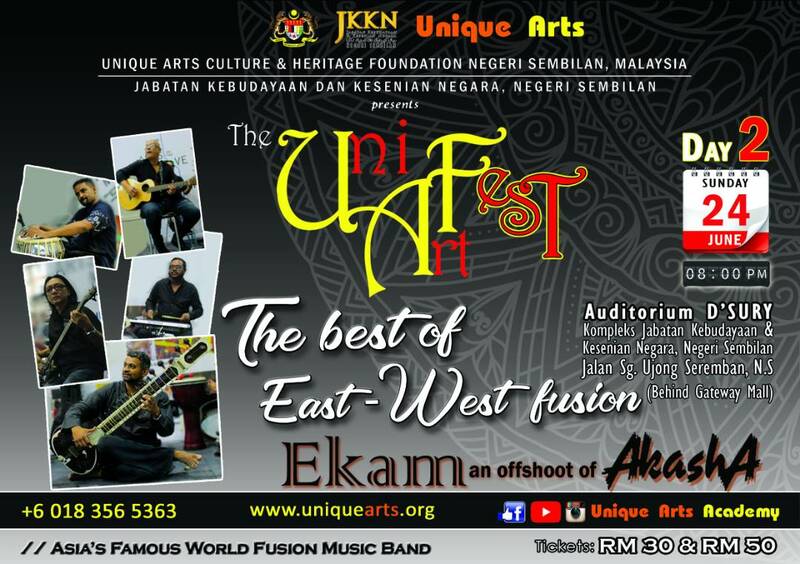 Kompleks Jabatan Kebudayaan & Kesenian Negera Negeri Sembilan which is located at Jalan Sg Ujong, Seremban will be playing the host for this fun filled beautiful art festival. Now going on to the 3 REASONS on why you should attend this, I would start off with my personal favourite reason and I believe it is also going to be your favourite reason too! 1. IT IS SUPER CHEAPPPPP!!!! Tell me who doesn't like the word "cheap". This time you have an opportunity to enter the beautiful world of arts at an absolutely affordable price! Perhaps in the past you would have stopped yourself from attending any artistic event because you needed to fork out hundreds of ringgits and that may not have been feasible for you. I have been told that there is going to be an extravaganza of dances lined up just for YOU! 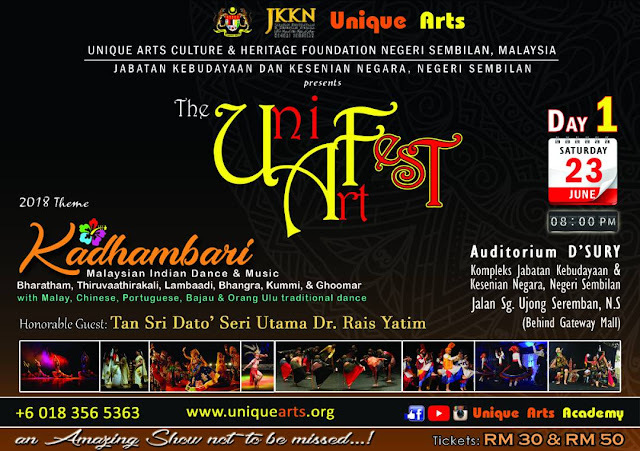 Split into two themes, you will experience Ancient Arts of India Dance and some local flavor in the form of Unique Malaysian Art Dance. I am so excited to watch the Indian Folk Drums, The Yiǔsǎn Dance (Chinese Dance) & The Daling- Daling Dance from the Bajau Sabah people. Regardless how many dance you have that night, it will be complete with some Punjabi Bhangra dance to keep your feet tapping and the Uni- Art Fest 2018 has that in-store for you too!! 3. Forum on ART and a MUSIC CONCERT!!!!! One of my favourite part about this art festival is that it is not only about entertaining us but also educating those who are attending it. With the ARTS FORUM in placed here, key topics like the importance of Performing Arts, how Arts can discipline kids and why you should consider Arts as a profession are being covered and it can only be beneficial to us. Once you are done with that, it is time for the musical to begin. Being a fan of fusion music, having listening to AGAM for years , there is something beautiful and magical about fusion music which is hard to be found elsewhere. In the Uni-Art Fest 2018, the organizers have gotten us EKAM, an offshoot of the AKASHA Band to be performing and entertaining us with the blend of the best from East and West. The key highlight of the show is definitely going to be the musical magic of SITAR. So what are you guys waiting for go now and get yourself the tickets immediately and float yourself away this weekend with the artistic brilliance at the Uni-Art Fest 2018. See you there!!!!! Triple Treat: Who Won The Battle Of The Bands?